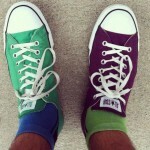 Do you really wear odd socks, and why do you do it? Yes I actually do wear odd socks. 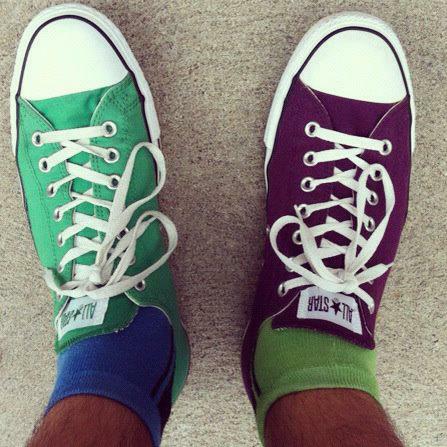 I do as a general statement against the absurdity of society and conformity, what is it about society that makes us think we should have to wear a pair of socks the same colour? The simple act of wearing odd socks allows me to illustrate that point easily. We are often explicitly and implicitly told how to behave, how to dress and how to act, as such some see the act of wearing odd socks completely foreign and weird. Wearing odd socks is a subtle way of making people think outside the square.For me odd socks are not odd at all, the expectation the socks should be the same is odd. Can I call you a Gypsy? Yes, although many Roma (our actual ethnic name) do not like to be called a Gypsy which I fully understand and support. Gypsy is a name that was given to us and can be used as a derogatory term. It was based on the assumption of our appearance and skin colour, people assumed we were from Egypt. Also, it tends to assimilate all Roma as a single homogeneous group, which we are not, we have different communities with different traditions. For example, it would be similar to assuming all Europeans were the same, spoke the same language and had the same customs and culture. With that said however, I use the word Gypsy a lot. Because of my name I get asked what my ethnicity is, if I say Roma people assume I am either Italian or Romanian, which I am neither. If I say I am Gypsy people immediately know the ethnicity I am from which in turn often opens up a dialogue about Roma allowing me to dispel much of the stereotypes and myths that surround us. Do you steal, live in a caravan, are you dirty, and can you tell the future? These are common stereotypes and myths about Roma, none of which are true. Firstly, I have stolen stuff in the past, however that is not because of my ethnicity or genetic make up. I once stole my friend’s Star Wars Storm Trooper action figure when I was 10, it wasn’t because I was Gypsy, rather because I loved Star Wars and wanted that toy! I did enjoy it for about 2 weeks until my friends visited and realised I had it… I’m sure each of you reading this have a similar story, does that mean you’re Gypsy too!? Many Roma still live in caravans, we are nomadic people by tradition. However, in my family, the travelling stopped with my Mother’s parents, they were the first in our family to own a house. But many of our traditions still live on, just because we aren’t mobile doesn’t mean we aren’t Roma. I can have a dirty mouth if you catch me in the wrong mood? But besides that Roma’s actually have strict hygiene rules which are passed down to us, many of which I still follow. Do you watch Big Fat Gypsy Weddings? I’d love to have you on my podcast soon. Are you on skype?